We got a great episode this week, and that’s very nice. But the lateness of this review means I’ve had more time than usual to think about it, and I’ve found myself with a lot of questions. That’s not at the expense of the show, or the episode, or anything, really. It’s just that at one point my thoughts came together…and then they had time to drift apart again. So I’ll run through my usual list of the things I enjoyed, but then I’d like to open a few things up to discussion. At this point I don’t think we have any correct or incorrect answers, but I’d definitely be curious as to other peoples’ thoughts. Firstly, I recant my observation last week that our nebbish, budding drug dealer would be season two’s main client. While that’s still possible, it’s much less likely after the events of “Cobbler,” which see Jimmy clearing him of criminal suspicion by inventing a legal excuse for the man’s nervousness and secrecy. And that could well represent the end of that particular arc. Which is okay; tying off that loose end doesn’t sacrifice any of that buildup so much as it allows it to feed other stories. Mike now knows where to find Nacho. Jimmy’s further implicated himself as Mike’s quasi-legal fixit man. And Kim — poor Kim — is second guessing, at least in the moment, the support she’s shown Jimmy through the years. In fact, it’s easy to argue that the rush of confidence she gives him early in the episode is what leads to him accepting Mike’s ethically dubious proposal in the first place. A heartwarming moment flows gracefully and without interruption into a potentially very dark development. It’s a lovely illustration of the way comedy and gravity co-exist in this show, and I loved how easily and naturally that turn came. Chuck’s temporary return to HHM was also handled brilliantly, with Jimmy’s immediate clench of anxiety when he saw the plastic tub being palpable and painful. It was a great moment, taking one of the sillier aspects of season one (by which I mean no disrespect) and bringing it back as an emotional punch for season two. Chuck’s arrival interrupts Jimmy’s speech…his confidence falters…the lights go out one by one around him. I’m not sure exactly what Chuck’s motive was for returning. Clearly it was something to do with Jimmy, and he tries to pass it off later on as “bearing witness,” but doesn’t make it clear as to whether it’s witness to Jimmy’s ascent or tumble. From Jimmy’s perspective — the one with which the show aligns us in that scene — it was a dickish thing to do, whatever the motive, and seeing his brother again instantly knocks him off center. …but Kim is there. Kim, who arranged to be there. Next to him. For him. She cares about him, she believes in him, and she knows what he’s capable of, even when he doubts it himself. And with a touch, she brings him back. It’s a sad and triumphant moment at once, and it both makes him feel better and more bitter. He does his best to blow off Chuck after the meeting, and then immediately agrees to help Mike in what he’s openly told will require him to recalibrate his ethics. Confidence and bitterness are a dangerous combination. Both of this episode’s legal entanglements show what sets Jimmy apart: he’s willing to get his hands dirty. Just as he crawled around in a dumpster in last season’s “RICO,” and tracked the Kettlemens through the woods in “Nacho,” he’s willing to sit with every elderly Sandpiper resident and dig through their financial records seeking the evidence he needs. Lawyers operate cleanly, need to appear collected and respectable at all points, and send others to do their dirty work. Jimmy is used to the dirty work, and sees no such distinction…which allows him to build the case in ways other lawyers cannot. It also, of course, allows him to fabricate evidence by directing pie-sitting videos starring his client. The same thing that could make Jimmy a great lawyer already, we know, makes him a criminal. So, yes, “Cobbler” was great. But I have some questions. Firstly, what is Chuck’s role on this show? It feels to me almost like his main arc was wrapped up at the end of season one, and while I’m not complaining about having Michael McKean pop up every few episodes, I do wonder what they intend to do with him. Am I concerned? Not even slightly. But season one built up my expectations toward one thing, and then gave me something else. Here, I don’t know what expectations I have at all, unless it’s that he’ll fluster Jimmy now and again, which doesn’t seem like a rich narrative development to me. Did Chuck outlast his utility? Or do you guys see something I’m not seeing yet? Again, I’m not writing him off…I’m just not sure where he’s going. Secondly, the conversation with Kim at the end was fantastic, but only later did something occur to me. Yes, fabricating evidence is illegal. That makes sense to me, and it makes sense that Kim would react in exactly the way she did. But she was laughing at the rest of the story, and enjoying the anecdote. Which implies that she’s okay with actively lying to police officers with the purpose of interfering with their investigation. Now, trust me, I’ve watched enough television that I’m aware of the grey area attorney characters walk constantly. It’s fine, to me, if Kim is okay with lying but not with falsifying evidence. There’s a point at which that distinction becomes less clear, but on its surface, I understand that. My question is this: isn’t it still illegal to lie to an officer the way Jimmy did? Kim’s concern at least in part seemed to have to do with the trouble Jimmy could find himself in, but wouldn’t he already be in that trouble by virtue of having lied at all? He spun a very specific story to the police, which could be accepted or disproven just as the “evidence” could have been. Was he not already in trouble from the moment he started telling his story? I don’t know. I don’t have a legal background, and I could be way off, but I’d be surprised if lying to police officers in that context was okay. And if it’s not okay, I think I buy Kim’s giddy enjoyment of the a little less. Is it more that she’s okay with all lying in the service of a client, but worried that the pie video specifically would make it easier for them to prove he’s lying? Those are logistical questions, though, and while I’d be interested in hearing peoples’ thoughts, neither of them are especially important to me. Much more interesting is comparing the world of Better Call Saul to the world of Breaking Bad. In that latter show, we didn’t have to wait long to see blood being spilled, lives being taken, innocents in danger. Bad decisions in Breaking Bad were really bad decisions with really bad consequences…a theme that carried from the pilot to the very last episode. 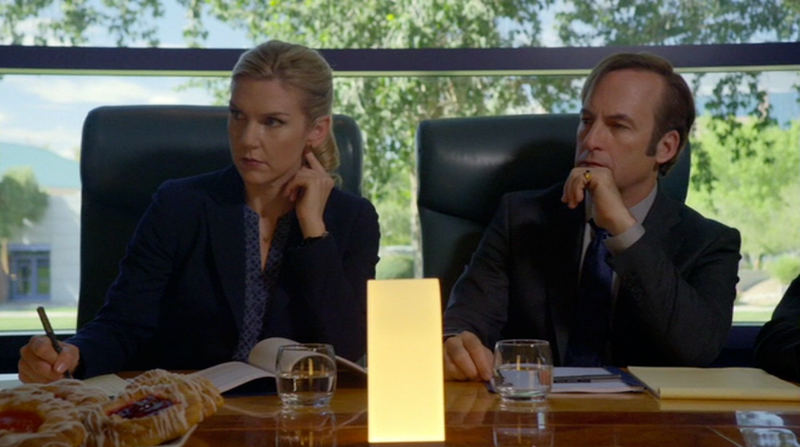 In Better Call Saul, however, the stakes are lower. These characters are in danger of being lied to, misled, betrayed, taken advantage of, ripped off, intimidated, ridiculed. They’re not in danger of being strangled, gassed, gutted, stabbed, dissolved, blown up, shot. And that interests me, because this character occupies both of those worlds. At one point, his decisions lead him from one degree of everyday consequence toward another. That’s Jimmy becoming Saul, yes, but it’s also one man choosing — for one reason or another — to open a Pandora’s Box of violence and danger. And why would somebody choose this? To leave the smaller punishments behind in favor of the larger ones? To turn away from personal slights in favor of being kidnapped and held at gunpoint in the desert? To stop helping a small-time crook out of jam and start suggesting that big-time trouble makers be sent to Belize? There’s an easy answer: the rewards are bigger as the stakes get higher. But something tells me it’s not as simple as that. That’s the reason for Jimmy becoming Saul, potentially, but not the reason for a man to willfully thrust himself into a more dangerous, potentially fatal, lifestyle. More likely? By the time he makes that decision, he has literally nothing left to lose. Remember that when he’s on the bed with Kim, and she’s wearing his University of American Samoa shirt. She warns him against going down a dark path…and we know he’ll do it. We know he’d lose her if he did. But by the time he does, I don’t think she’ll even be around to lose. Here’s my perspective on what effect Chuck has on Jimmy–and it’s partially because they’ll always be Chuck and Jimmy, never Charles and James. They’re stuck in this messed-up Parent – Child relationship (I’m speaking in transactional analysis terms). Chuck showing up is the critical Parent speaking; Jimmy deciding to blow off ethics is the rebellious Child responding. Also, the rebellious Child gets to play (in the dirt, but it’s play) and amuse itself by creating funny stories. Jimmy’s had few opportunities to experience rewards in the form of actual praise (that scene where he so tentatively passes on unearthed information in the office of one of his bosses), so he gets it where he knows it’s available. Plus, holy crap does that light switch symbol come back so strong this week. He’s never supposed to turn it off, but Chuck’s fears are a stronger force than Jimmy realizes. So I write this after having watched S2 E3, and so I have a clearer picture of the Chuck issue. But here I didn’t really have a problem with him. He adds a realistic tension to the episode that has the potential to play out in multiple ways. We’re used to a Breaking Bad universe rich in symbolism, foreshadowing, and adherence to Chekhov’s Law, but the real world is not like that, so I don’t mind Better Call Saul employing a slightly less motive-driven structure. After seeing Episode 3, it occurred to me that Chuck is much like the serpent in the Garden of Eden. While he’s being cast as the bad guy, he’s really the one telling the truth.